Moments after Craigslist founder Craig Newmark joins the Wikimedia/Wikipedia advisory board things start to go crazy. I sat next to Jimbo at a Wikipedia dinner over the summer. I begged him to put a leaderboard on Wikipedia and told him I would get AOL to sell it and host Wikipedia–for free. He declined saying there will never be ads on Wikipedia. I then explained to him in detail how that one leaderboard could make over $100M per year. I told him that they should take the $100M and give it to charity. They could help fund MediaWiki, the EFF, Firefox, and dozens of other open source projects. 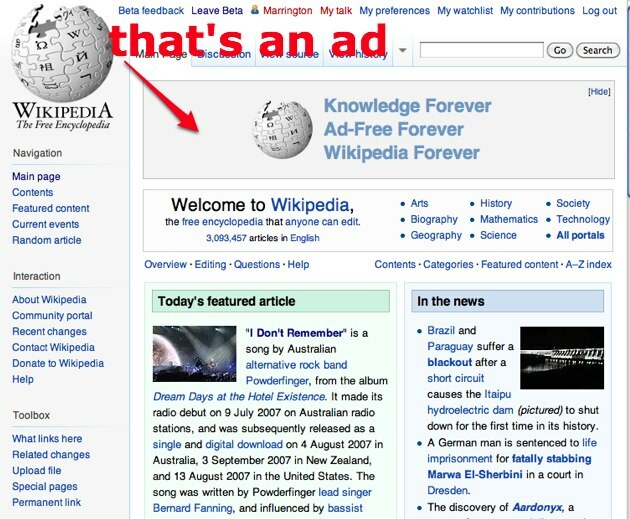 Agree with them or not, Wikipedia has held firm to their no-ads philosophy, struggling through with donations instead. But today Rex Hammock noticed something on Wikipedia – a banner ad. These aren’t “real” ads promoting third party sites, products, etc. They’re just in house ads reiterating the policy that Wikipedia will never have ads. But they clearly are ads. As a commenter notes below, Adblocker even filters them out. “Knowledge Forever, Ad-Free Forever, Wikipedia Forever,” say the ads. They link to this page asking for donations to the Wikimedia Foundation. Update: Readers point out that this is an annual effort by Wikipedia.